The inaugural Sonica festival is running in Glasgow from 8th-18th of November across various venues, produced by Cryptic. Subtitled "sonic art for the visually minded" it tries to provide an opportunity to showcase work from Glasgow and across the world which doesn't normally fit easily onto a gallery wall. Now, I have always had a leaning towards music which resembles vacuum cleaners in dust cans falling down a lift shaft, so I was hoping to find lots to intrigue and entertain me in Sonica. The programme is imaginative and varied. Some of it is aimed specifically at children (such as Sonic Dreams). Others have a seemingly childish simplicity that would appeal to anyone, such as Kathy Hinde's kinetic sculpture, Piano Migrations, in the foyer of the Scottish Music Centre. It is a hypnotic sight as wee birds projected onto the strings of an up-ended piano cause motors to twitch and pluck the strings as the birds tweet about its workings, like a John Cage work brought to life. 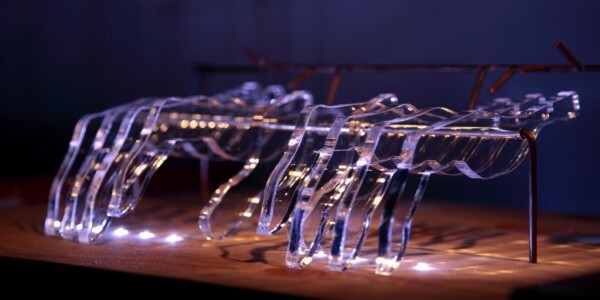 Over at the Traway a more dramatic kinetic sculpture is on show from Korean artist Mookyoung Shin. Our Contemporaries is in a darkened room where dozens of perspex hands rest on desks. As each hand is illuminated in turn the impatient fingers drum on the desk with a repetitive tapping. It is a sight worth seeing, but hearing it is part of the whole dreamy atmosphere too that slowly builds. I was there with my kids, who felt it was like the drumming that The Master used in hypnotising the human race in an episode of Doctor Who. Very impressive in scale and execution. More was on show over at the CCA. Luke Fowler worked with Jean-Luc Guionnet's to produce his film All Divided Selves about RD Laing and is a current Turner Prize nominee. I won't be able to see the film they've made together for Sonica, which is on this Friday night. However I was able to go and see Pilgrimage from Scattered Points, about Cornelius Cardew's Scratch Orchestra on at the CCA throughout the festival. The "musicians" and composers on film are all so very earnest and sincere in their enterprises, whether dropping marbles onto a drum skin, scraping rocks across the floor or in the final sequence debating whether their self-expression in this music is enough to express their political ideas of the world. I like their earnestness. Upstairs at the CCA is the fantastically atmospheric and thought provoking Extended Play by Janeck Schaefer. Three groups of old-fashioned record players in a darkened room with red spotlights play separately the violin, cello and piano parts of a piece of music taken from a Polish folk song. As you walk around them you cause the record players to slow and stop, constantly changing the music. The blurb describes it as "a triptych for the child survivors of war and conflict" and started from the idea of 'Jodoform', music played by the BBC during WW2 to pass messages to the Polish Underground. It does make you ponder as you wander, reflect, think about the effect you have on the room. I liked it a lot. Along the corridor from it is another outing for Aidan Moffat and FOUND's "sound installation" #UNRAVEL, more stripped down than when I last saw it at Glasgow International 2012, but the idea is the same. You pick singles from someone's collection and unpick the story of their life from the monologues they trigger off. With the headphones on this time, rather than standing back in awe at the mechanical instruments as I did last time, I was more able to take in the stories being told. Remember Me by Claudia Molitor is being performed in the lovely setting of the Charles Rennie Mackintosh designed Scotland Street School Museum. We are gathered outside the room and lead in to find her dressed like one of the Greek priestesses who light the Olympic flame watching a projected film to the sounds of water falling and discordant strings. Then we are taken next door and about 20 of us watched her performance around an old white writing desk. She talks of the imagined phone call between the female operatic heroines Dido and Eurydice and "their good friend Cinderella" whilst taking objects from the drawers and projecting films onto it and herself. It made me think back to the fun I had as a child rummaging in the jam-packed drawers of my granny's old "bureau" which was full of the most random stuff. We were dismissed one by one at the end by words whispered privately in our ear by the elfin performer. "Remember me? ", I think I will. Bonkers, but good bonkers. I headed over to the Tramway hoping for more of the same. I made a quick dash over to the Tramway to see Bluebeard, again based upon opera, Bartok's Bluebeard's Castle, but described as "state of the art opera for the digital age", produced and performed by the "33 1/3 collective", a collaboration of Dutch artists. The story of Bartok's opera has Bluebeard's new wife insisting he opens the seven castle doors, revealing various dark secrets. In this staging bizarre and spectacular images are projected onto a large cube in the centre of a darkened hall whilst music and singing/ chanting rings out. Some images and sounds are startling, like the coins spinning onto the floor as the treasure room is opened, whilst in others the artists come onstage to interact with them, such as apparently sweeping corpses onto a stretcher. I have never seen anything like this before. Absolutely stunning, although the visuals overwhelmed the music a bit. Between shows at the Tramway I played with Tim Cooper's Dora, a computer programme set up in the foyer where your typed in thoughts are translated into electronic music, of sorts. The best show of the night for me I'd saved until last. "Tales of Magical Realism - Part 2" by Sven Werner. Part 1 was apparently done at Cryptic Nights, the previous incarnation of this festival and both are based on his film Oculista and featuring musician Graeme Miller. The description in the programme didn't give many clues to what was in store for us. Initially our group were led outside and up a fire exit at the back of the building to enter a hall where three musicians were playing at the far end, whilst a ballerina performed in the middle of the hall. It takes a while to realise the dancer is bound by a line of twine to a weight on a pulley. We are measured and given a raffle ticket on arrival, and every 5 minutes the doors at the far end opened, a bell rings and three of our ticket numbers are called forward. After an eye examination akin to Deckard's V-K test and a serenade in German, the three are lead away to another room. Meanwhile the musicians and ballerina start up again as we shuffle about in the room, keeping out of her way. Down a corridor we enter another room of the installation, where music and spoken word through headphones we are given tell us a mysterious story. We are guided to look through an array of Heath Robinson contraptions, sort of zoetrope machines. The last stage of the story entails a one in three chance of you ending up on a penny farthing to power a dynamo to illuminate the end of the story. The whole thing was a joy, a vaudevillian version of Blade Runner, re-imagined by a Victorian Tom Waits. The surreal nature of it all was added to by the fact that I knew the guy on guitar, having worked with him about 15 years ago. Very strange. Overall Sonica was full to bursting with the type of music, performance and sonic arts that I absolutely love. The reduced prices for advanced booking and 3 for 2 offers meant I was able to see loads of stuff in the festival and I hope to find it returning next year.